Patrick Bamford shoots on goal against Bolton Wanderers at Elland Road. Marcelo Bielsa maintained his 100 per cent start as Leeds United head coach as his much changed line-up went through to the second round of the Carabao Cup at the expense of Bolton Wanderers. First half goals from new signing Patrick Bamford and Samu Saiz proved enough to give the Whites a 2-1 victory in a lively tie which saw some decent football. The United side showed eight changes from the line-up that started at Derby on Saturday with goalkeeper Jamal Blackman, teenager Jamie Shackleton, midfielder Lewis Baker, wide men Tyler Roberts and Jack Harrison and striker Bamford all starting for the first time in a Leeds shirt. Young left-back Tom Pearce came in for his first game of the season as did Pontus Jansson in a back four that also included Shackleton at right-back and Luke Ayling at centre-back. It did not matter too much about all the changes as the Whites made another bright start as they had done in their opening two league games. In the third minute Baker raced clean through only to miscontrol and for the chance to go begging. Bamford produced a weak finish after getting on the end of a delightful chip over the Bolton defence by Saiz. Bamford did better with an effort four minutes later when he turned smartly on the edge of the box and fired in a shot that fizzed just the wrong side of the post. Bolton managed their first effort on 20 minutes with Jack Hobbs’ header from a corner directed straight at Blackman. Gary O’Neil sliced an effort wide from the edge of the box, but it was United ahead in the 28th minute as Bamford nutmegged his marker just outside the box to open up some space and beat keeper Remy Matthews with a fine low shot. It was almost two when Harrison got onto another great Saiz chip over only to hit his volley wide from an angle. However, a second goal came in the 35th minute when Baker broke into space from his own half and found Saiz on the edge of the box. The Spaniard looked to have missed his chance when holding onto the ball, but produced a low shot that found its way into the net for his first goal of the season. Wanderers looked to step up their pace after the break and were level within seven minutes as United failed to clear a Yanic Wildschutt cross and the ball invitingly for Erhun Oztumer to score from the edge of the box with a well placed shot. 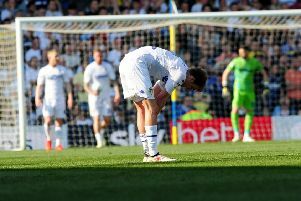 Leeds recovered their composure, however, and could have scored a third as Bamford volleyed over after the ball fell nicely for him on the edge of the box. Bamford then saw a shot saved low down by Matthews following a great run by Saiz. The hosts had a let off when a long range strike by Wildschutt was only parried by Blackman straight to Jonathan Grounds, but he blasted the rebound over. Bolton threatened again as a ball over the top set substitute Josh Magennis free, but after a poor second touch his shot was comfortably saved by Blackman. Harrison, who showed good skills at times on the left wing without much end product, produced a smart turn in the box only to shoot over for the Whites. Harrison also shot over from the edge of the box and substitute Ezgjan Alioski saw a weak shot easily saved following a good passing move. Leeds saw out the remainder comfortably enough and could have added to their lead late on when Baker went on a good run into the box, but saw his angled shot saved. Leeds: Blackman, Shackleton, Jansson, Ayling, Pearce, Phillips, Roberts (Alioski 68), Baker, Saiz (Klich 68), Harrison, Bamford (Roofe 80). Bolton: Matthews, Little, Hobbs, Wilson, Grounds (Taylor 74), Vela, O’Neil, Oztumer, Donaldson (Noone 57), Wildschut, Hall (Magennis 65).